SRV (Service) records are resource records used to identify computers that host specific services, such as FTP. For example, a client might issue a request for the SRV Record to find the host name that provides the service for a specific domain name. The service might be used on that domain name or a different one might call it. 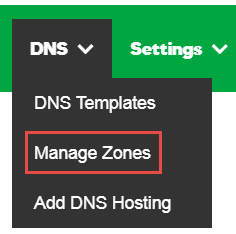 On the DNS Management page, at the bottom of the Records section, click Add and select SRV from the menu. Service - Enter the service name of this SRV record. The name should begin with an underscore, such as _ldap, _ftp, or _smtp. Protocol - Enter the protocol the service uses. The name should begin with an underscore, such as _tcp or _udp. Name - Enter the host name or domain name the SRV links to, such as server1. If you want to link the record to your domain name, type @. Target - Enter the host name of the machine providing the service, such as host.example.com. Priority - Select the priority for the SRV record. For multiple records that have the same Name and Service, clients use the priority number to determine which Target to contact first. Weight - Select the weight of the SRV record. For multiple records that have the same Name, Service, and Priority, clients use the weight number to determine which Target to contact first. Port - Enter the port number for the service, such as 80 or 21.